I read this article and found it very interesting, thought it might be something for you. The article is called Modi’s Rallies Worked But The BJP Lost and is located at https://archive.indiaspend.com/bihar-votes-for-its-and-indias-future/modis-rallies-worked-but-the-bjp-lost-87748. While the Bharatiya Janata Party (BJP) had an overall strike rate of 33% (53 seats out of 160 contested) in the recently concluded Bihar elections, an IndiaSpend analysis has found that Prime Minister Narendra Modi’s strike rate was 45% (13 out of 29) i.e. success rate of the BJP in constituencies where Modi addressed rallies. Keeping with their previously tried-and-tested strategy, the BJP chose to project Prime Minister Narendra Modi as their main campaigner and did not project a Chief Ministerial candidate. With the Mahagathbandhan (Grand Alliance) securing two-thirds majority in Bihar assembly, the BJP has suffered the second consecutive electoral loss this year. Though the BJP won 53 seats, did Modi’s rallies have an impact in the constituencies he campaigned in? 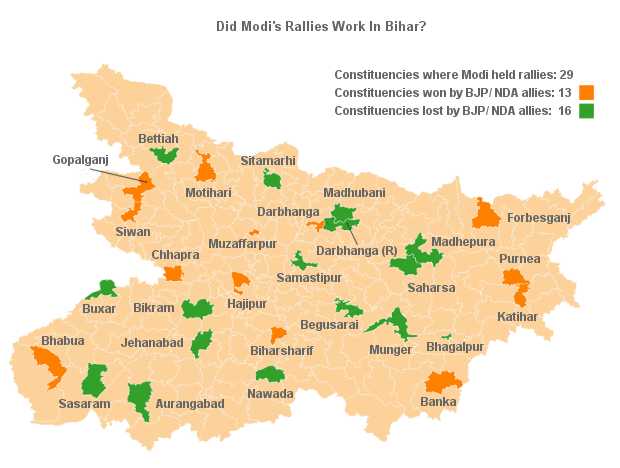 Muzaffarpur was won by the BJP where Modi addressed two rallies (July 25th and October 30th). Starting from the Parivartan (change) rally Muzaffarpur on 25th July, Modi addressed 30 rallies across different parts of Bihar with the last ones on November 2nd – Darbhanga, Purnia and Forbesganj. Except Jahanabad and Darbhanga rural, the main contest across all constituencies covered by Modi was between the BJP or a Grand Alliance constituent (Janata Dal (U), Congress or Rashtriya Janata Dal). The highest and the lowest margin of victory in these 29 constituencies was secured by the Congress – 44,311 in Bikram and 2,320 in Bettiah. 1. The data on rallies have been taken from the BJP’s official website. 2. 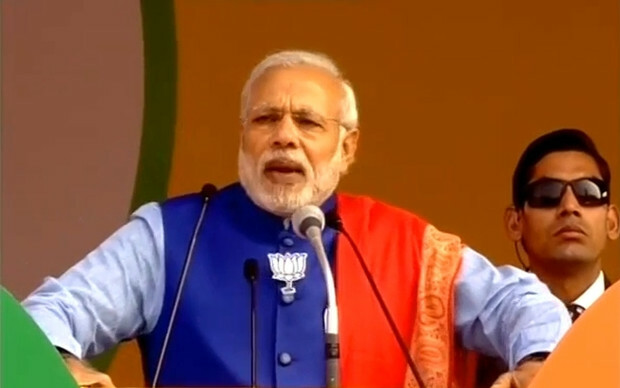 Modi’s rally was in Darbhanga town but Darbhanga rural (separate constituency) has also been included.